Krystal is by FAR one of the best - talk about customer service. I have never received such superb customer service and be so impressed by the wonderful quality and attention she puts into her work. I would 100% recommend to anyone to purchase wedding invites, save the date cads, etc. through Krystal. We ordered our save the date cards, live in Canada, and we had them in a week. 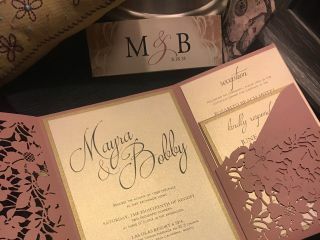 Most certainly will be ordering our actual invitations from her as well and can not wait to see how beautiful they are as a result of her dedication to details and focus on customer satisfaction. Krystal was great to work with and did an amazing job on the invitations! We have had so many compliments on them and many said they were the most beautiful wedding invitations they had ever seen! We could not be happier and have subsequently order Thank You notes to match the invitations! Our invitations turned out absolutely gorgeous and Krystal made the process so easy! Krystal is professional and personal, going above and beyond to ensure that her customers are happy. The final product was everything we were looking for, and more! We are so pleased and will definitely use her for any future needs! Yes I would recommend Krystal to anyone! I worked with Krystal for my two daughters invitations. Working with Krystal was wonderful. She was always there to answer my questions or to make changes to what I thought I wanted. The quality of her invitations was extraordinary! everyone loved them! She did an amazing job!!! She heard me out and perfectly did everything. 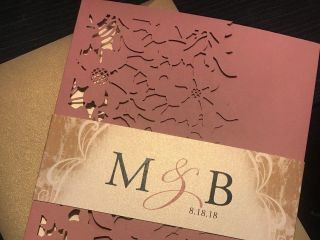 Not only did I think the wedding invitations look amazing, countless people told us that they were the most beautiful invitations they have ever been given! 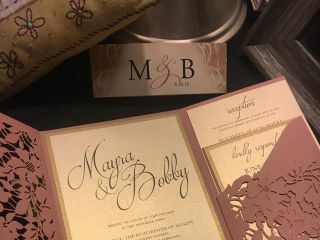 We loved them so much that we decided to get reception invites done by Krystal as well, and then also decided to have her do menu cards. I cannot wait to use her again in the future and recommend her to everyone!!! We went to Krystal for our wedding invitations, Krystal was very helpful, very patient and she did a wonderful job with our wedding invitations. Krystal responded quickly whenever we emailed texted her or called her. She always responded right away. I would highly recommend Krystal for high quality invitations...! When it came time to picking out my invitations I was beyond stressed out. I worked with Crystal via email (across the country) and it was the easiest experience ever. I told her my color scheme, the theme I wanted and she was able to make a sample and send me a picture so I can approve it. She answered my emails right away. I would highly recommend her. She was a delight to work with, very affordable, and my invitations were beyond beautiful ! Best wedding invitations, beyond professional, helpful, & accommodating. My wedding invites were exactly what I dreamed of. Krystal mad my dreams come true!! She helped me the whole process, and super fast too. I can’t wait for my brother to get engaged just so we can do business again here! She is the real deal!! So beyond happy. I came across Krystal through Yelp. She was unbelievably so fast at responding, I even set up an appointment the same day. She was so attentive and so quick with the invitations. The proof was emailed to me in only a few days from booking her. The whole process from brainstorming the design of the invitation to having them ready took two weeks. Which is incredibly fast. 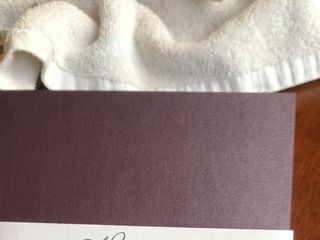 The invitations are so elegant and detailed. She also provides the stamp on the rsvp, that way it's easy and convenient for the guests to mail them back. All of our guests kept texting us complimenting the invites. Thank you Krystal! I plan on doing business with you again! Krystal's Wedding Invitations is the BEST! She is so responsive and makes sure you like every detail before she finalizes your invite. I am so glad i found her!! Krystal did an amazing job creating my wedding invitations. She was so patient with me making some changes and responded to all my questions so quickly. I highly recommend Krystals Wedding Invitations! Krystal did an amazing job with my destination wedding invitation. I am not very creative but Krystal did all the thinking for me and responded so fast! Thank you Krystal! 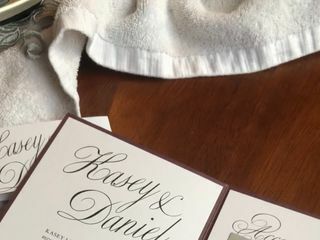 Wedding invitations looked great, Krystal will fix them until you love them! I love the fact that she is very responsive to e-mail or text. During the course of wedding planning there were several last minute things that pop up and she handled them all! Thank you Krystal for your hard work & responsiveness. I found Krystal’s invitations through research online. 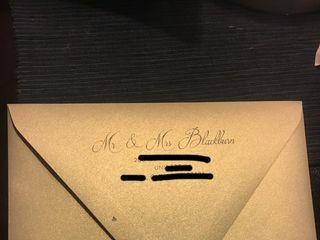 I had been to 3 invitation places for my wedding invitations before I found her. I was extremely happy after meeting with her because she put together the invitation I had envisioned with very reasonable prices. She helps guide you through the process and makes sure everything is how you want it. She is very accommodating and responds quickly if you have any questions or concerns. She was flexible with changes. I absolutely loved my invitations. They came out gorgeous and I received so many compliments. I highly recommend her to friends and family and will continue to use her services. Krystals invitations were amazing! 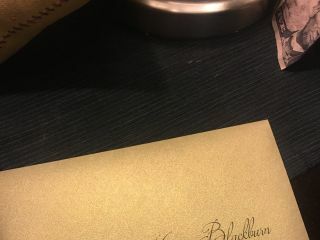 She emailed me right away about colors and different possibilities she could do with my invitations and they came out so perfect. I loved them and so did our wedding guest. Just perfect! Couldn't be happier!!!! Krystal has amazing customer service, I was so impressed with her quick responses even during the holiday season. I just received my invitations and I’m blown away on how amazing they turned out. I can’t wait for my guests to see them. I would use Krystal 100x over again! Krystal is so sweet and wonderful to work with! She is so creative! I gave her all the ideas that I liked and she created the perfect Wedding Invitation! Worth every penny for a one of a kind invitation of good quality! I highly recommend her for all Invitation needs! We would highly recommend Krystal she Is absolutely amazing!!! Everything about her work and dedication is perfect!! Thank you again for eveything! Anyone who chooses her will NOT be disappointed!! Krystal was an absolute pleasure to work with. She is extremely responsive and accommodating. My wedding invitations were absolutely beautiful and I had compliments on how unique and beautiful they were. Krystal's designs are gorgeous and she is great at customizing them to you from thand color to the wording. Working with her made the wedding planning experience that much more enjoyable. She comes highly recommended, you can't go wrong working with such a creative, detailed oriented and overall genuinely nice person. I loved working with Krystal!!! She has been fun, flexiable and and creative all while maintains professionalism. I'm in love with my wedding Save the Dates and Invitations we created. I would highly recommend Krystals Wedding Invitations to family and friends without hesitation.